Finally, a book that promised to be fast paced that actually was un-put-downable! I was a little hesitant because I've been let down by these thriller-author hyped books recently but I am so thrilled to report that this book was borderline phenomenal! I'm back with another review, today it is The Chalk Man by C.J. Tudor. Thanks so much to Penguin Random House for sending me an ARC of this book for an honest review, as always, all opinions are my own. This story follows Eddie in two timelines. 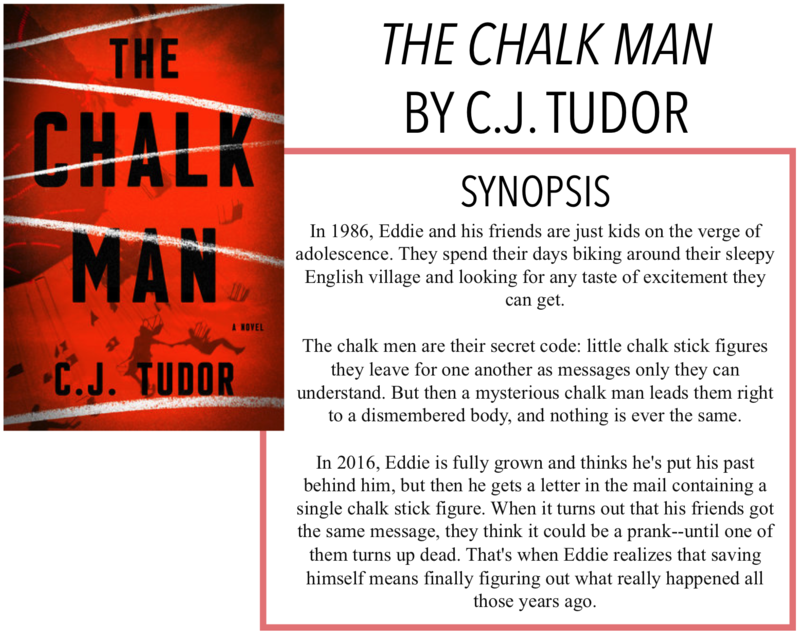 One is back when he was a child in 1986 when he and his friends found the body of a young girl and the other is the present day in 2016 when one of those old friends resurfaces wanting to rework through what really happened, and he is sent a mysterious chalk drawing like the ones they used as children. Eddie and his friends don't think much of the mysterious letter until one of them turns up dead. Soon, old secrets Eddie has been trying to forget come to light and he is forced to question what really happened three decades ago. While this is Tudor's debut novel, she truly writes like a seasoned pro. She is able to seamlessly intertwine the two timelines so that they flow together brilliantly. The pacing is spot on and if I didn't have to go to bed, I would have easily finished this book in one sitting. It wasn't your typical fast-paced psychological thriller but a perfectly paced enticing story that kept you engaged until the very end. There were plot twists and little side storylines that all worked together to create a suspenseful story. It was much more than a simple 'whodunit,' more like an examination of a group of children's childhoods and the horrible things they went through. The murder of the girl was definitely a driving force of the novel, but not the only plot stream being followed. I really enjoyed the side storylines and how they all helped the story on a larger scale. Coincidentally, this book had some vague similarities to The Kite Runner, which is one of my favourites and may have helped me enjoy this one so much. I think the comparison more stands with the coming-of-age tale of bullying, assault, and atonement of sins of these two novels, less on location and general storyline. The murder definitely also separates that story from this one. I won't really get into it, but this book does talk about some more mature sexual themes and there is a fairly graphic depiction of sexual assault (perhaps another similarity with The Kite Rinner). I would say there are trigger warnings for sexual assault because of this and wouldn't recommend it to younger readers. Eddie's mother is also a doctor at an abortion clinic and there are some protests and discussions of this within the novel that may be harmful to some readers. Overall, I would probably call this one of the best thrillers I've read in a while, and it wouldn't surprise me if this one made its way onto my favourites list of 2018.